Many cancer patients face hair loss, also known as alopecia, as a result of undergoing treatment. While this is a common side effect of cancer treatment, losing one’s hair can still be a significant emotional challenge. The good news is that this change in appearance usually doesn’t last forever. Most cancer patients see hair growth begin shortly after they are finished with their treatments, but until that time many people turn to head coverings such as wigs, turbans, and scarves to help them feel more comfortable during this stage. The thought of wearing a wig may seem worrisome. There may be some concerns about how it will look to others, how it will feel, and how much it will cost. If you aren’t sure whether a wig is for you, continue reading this guide. We express our individuality through our appearance, which often includes styling our hair. While some people feel confident without a wig, others enjoy a confidence boost from wearing a wig during treatment. While you can certainly replicate your normal hairstyle with a wig, you can also have fun trying out new hair colors and styles. You can even have a few different styles on hand, giving you the flexibility to mix up your look whenever you want. Most wigs are easy to take care of, only needing the occasional wash and style. This allows you to enjoy a simple routine. Wearing a wig gives you the chance to feel empowered. While you can’t control the hair loss, you can control how you look during cancer treatment. Choosing the right wig can be overwhelming. Most cancer patients want to find one that appears natural-looking, fits well, feels comfortable, and is affordable. Below are some tips that may help make your experience a little easier. It is a good idea to purchase your wig before your cancer treatments begin. Not only does this make it easier to find a wig that better matches your current hair color, texture, and style, but it also allows you to be better prepared for hair loss once it happens. You may want to talk with your oncologist or someone else in your cancer care team before you make your purchase. If there is a chance that you will lose your hair, ask your oncologist to write a prescription for a "cranial prosthesis" rather than a wig to claim insurance benefits. Wigs needed for medical purposes are often partially or fully covered by health insurance, but you'll need to confirm with your insurance provider. After you make your wig purchase, you may want to make an appointment with your hairstylist. Some patients choose to get themselves ready by cutting their hair short. Some patients also choose to have their wigs trimmed and styled for their faces. Natural hair wigs are created from harvested human hair, which means they will look, feel, and act just like your own hair. Synthetic wigs are created from man-made fibers and are designed to mimic the overall appearance and feel of real hair. Many times, wig buyers think that human hair wigs are better than synthetic ones. This, however, is a misconception. In fact, it is often hard to tell the difference between the two when the synthetic wig is high quality. One perk of human hair wigs is that they can be colored, permed, and styled just like your own hair. Because of this, however, they are more expensive and often require much more maintenance. Synthetic wigs, on the other hand, are much easier to care for and are typically a lot more budget-friendly. Although they can’t be treated in the same manner as human hair wigs when it comes to styling, their affordability makes it possible for cancer patients to purchase multiple wigs that can be worn for different occasions. To help make the decision process easier, it is a good idea to visit a specialized wig store. 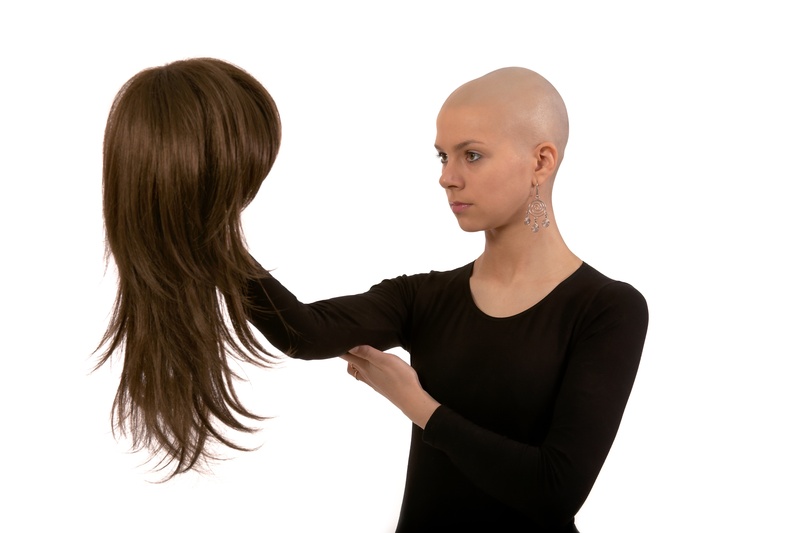 Since most wig stores have experience in dealing with cancer patients and hair loss, they will likely be able to provide advice and assist you in making sure your wig is both comfortable and well-fitting. Depending on where you live, you may or may not have a wig shop nearby. If you are located near Compass Oncology in the Portland-Vancouver area, we have resource page for wigs and headwear that you can download. Remember, the choice of whether to wear a wig is up to you. A wig should not make you feel uncomfortable or self-conscious. If you have more questions, you can always discuss them with your health care provider or your oncology social worker.